The big reveal! Wrenn’s Baby Quilt! I’ve made a lot of baby quilts in the five years that I’ve had this little hobby of mine. But I must say that this one was the most special by far, because this time it was for MY baby girl and not someone else’s. Squeal! Mr. 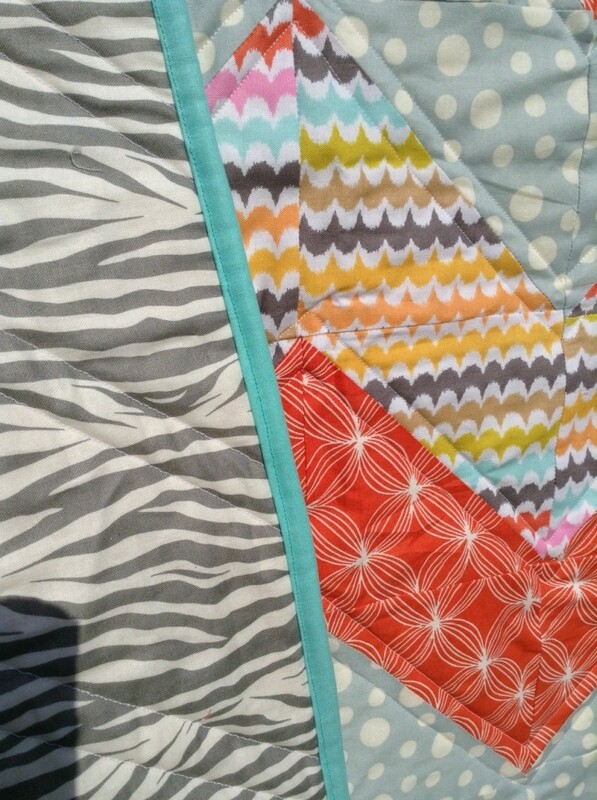 Right helped me pick out the fabrics, because we used them as a jumping off point for the rest of our nursery. The bright colors are a tribute to my man and his love of color. I probably have the only husband who has been to a quilting store… multiple times! Such a trooper, that man. 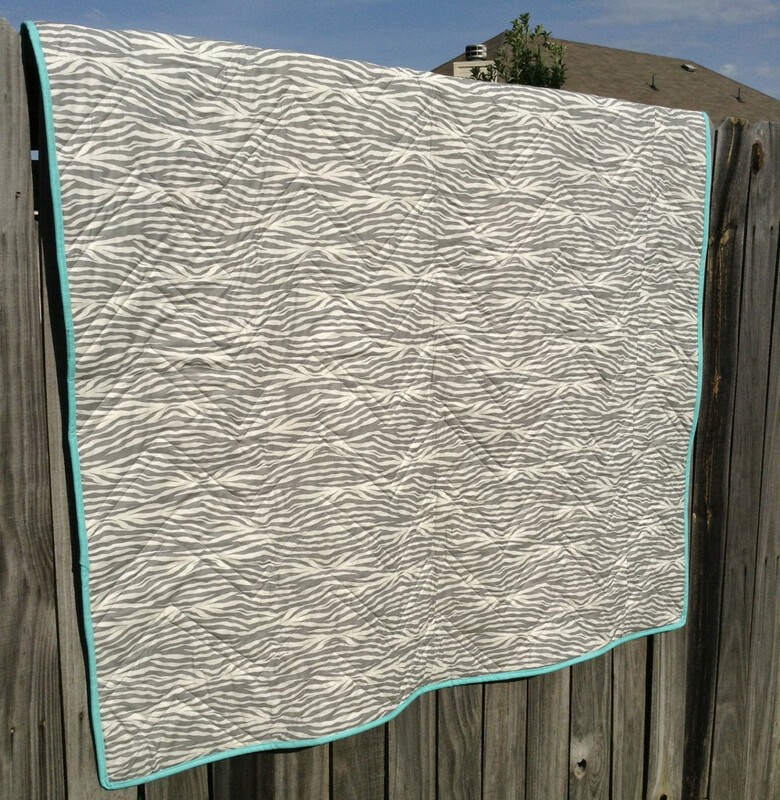 Speaking of chevron – I’ve had several people ask me for a tutorial on chevron quilts. Someday I will do some tutorials, but right now life is a bit nutty, so I thought I’d point you toward other people’s tutorials. I learned a lot of my sewing through blogs and YouTube, so never be afraid to just google something. 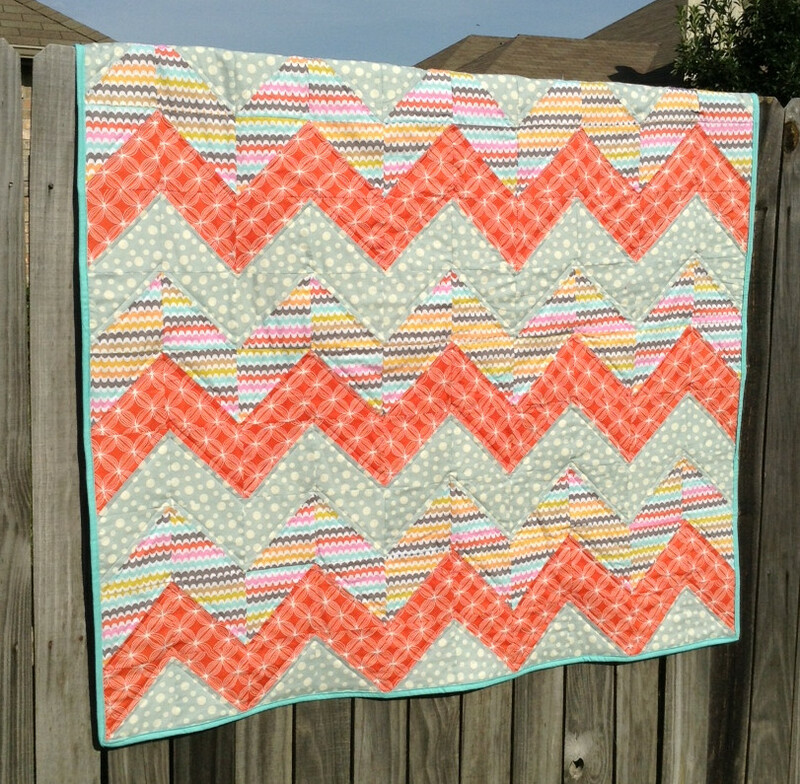 Two ways to do chevron – or any triangle quilt – are this way (my way is the first way they listed) and that way (I don’t do it this way, but it looks efficient so I may give it a try someday). Also, typically I cut my squares to 6 inches, simply because I like the finished look – not too big, not too small. They’re closer to 5 inches once sewn with a 1/4 inch seam allowance. I quilted everything with white thread (I almost always use white – that way I can just stock up on it in advance) and I loosely followed a chevron pattern. I’ve found that quilts are a lot softer and more snuggly if you quilt them more loosely – the more stitches, the stiffer it will be. I love this crazy zebra backing and bright turquoise binding. I wanted this quilt to scream fabulous and fun and not necessarily just baby. I hope this is one of those things she keeps the rest of her life. I still have the quilt my grandmother made for me when I was a baby. As I did my sewing I imagined my little blonde-haired girl dragging this all over our house, snuggling with it at night, and having it as a forever reminder that her mama loves her dearly. 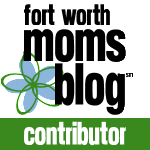 So I stumbled upon your blog via WordPress and am so happy I did. I love your baby girl’s quilt – she is one lucky lady. Beautiful job Bethe. Wrenn is a lucky little girl 🙂 By the way, so glad everything checked out ok the other day! Blessings. I LOVE it! Good job, and how special that she will have a quilt that her mommy made with love. What a special quilt! 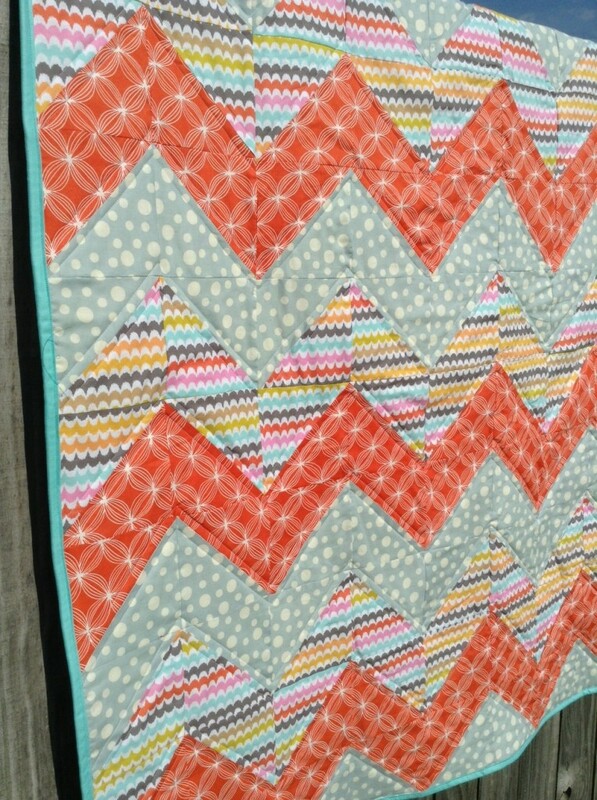 Love the fabrics, and of course it had to be chevrons! (I make them an awful lot, too!). Enjoy this special time. Thanks Valerie! I’m glad I’m not the only chevron addict! Beyond special! How wonderful that you are having a little girl. I do love the colors. I love that orange fabric, so totally makes the quilt. Congrats on having a girl !! !